Green Beans and White Beans with Sage and Tomatoes, quick and easy. In the winter I love to make white beans with sage; this is a summer version, adding green beans and fresh tomatoes. Fresh sage is at its best right now, giving a 'fall' flavor to the dish. Top and tail beans - cut off the ends. Cut into 1 1/2 inch lengths (4cm). 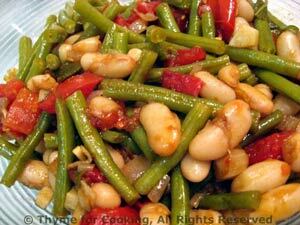 Add both kinds of beans and tomato, cover, reduce heat to low and simmer 20 - 25 minutes, until green beans are tender and done. If they start to dry out add a tbs of water or chicken stock.